The eastern bettong (Bettongia gaimardi), also known as the Balbo (by the Ngunnawal People who used to keep them as pets), southern bettong and Tasmanian bettong, is a bettong whose natural range includes southeastern Australia and eastern Tasmania. The introduction of the red fox and European rabbit to Australia led to the extinction of the mainland subspecies during the 1920s. The Tasmanian subspecies still exists. In 2012, a small population was reintroduced to the mainland in Canberra, where they appear to be doing well. This animal's habitat is dry, open eucalypt forests and grassy woodlands at altitudes between sea level and 1,000 meters. A major component of their diet is truffles and other underground fungi, as well as roots and tubers. Insects and grubs are also eaten. It is unique in that it will travel up to 1.5 km from its nest to a feeding area, a considerable distance for such a small creature. A nocturnal animal, the bettong sleeps during the day in a domed nest. The nests are made with densely woven grass, leaves and shredded bark in a sheltered site such as a shallow depression in the ground or under a fallen log or clump of vegetation. The animal uses its curved prehensile tail to transport the nesting materials to the nest site. The animal only uses the nest for one or two nights, before it moves on in search of food. Like other bettongs, the eastern bettong is a continuous breeder, producing young throughout the year. The gestation period is 21 days, after which the infant (referred to as a "joey") remains in the pouch for an additional 105 days. While the mainland population became extinct in the 1920s, the Tasmanian population has remained secure. One concern is that most of the bettongs are found on private land, with only two groups found within reserves. Red foxes are a major threat. The International Union for the Conservation of Nature has raised the threat status for eastern bettongs from least concern to near threatened. ^ a b Groves, C.P. (2005). Wilson, D.E. ; Reeder, D.M. (eds.). Mammal Species of the World: A Taxonomic and Geographic Reference (3rd ed.). Baltimore: Johns Hopkins University Press. p. 57. ISBN 0-801-88221-4. OCLC 62265494. ^ a b c d e f Menkhorst, P. (2008). "Bettongia gaimardi". IUCN Red List of Threatened Species. Version 2008. International Union for Conservation of Nature. Retrieved 29 December 2008. ^ Rose, R. (1997). Metabolic rate and thermal conductance in a mycophagous marsupial, Bettongia gaimardi. The World Wide Web Journal of Biology 2: 2-7. ^ Wakefield, N. (1967). Some taxonomic revision in the Australian marsupial genus Bettongia, with description of a new species. The Victorian Naturalist. 84:8-22. ^ a b Department of Primary Industries and Water (August 2006). 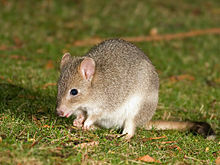 The Tasmanian bettong]. Department of Primary Industries and Water. ^ University of Tasmania, School of Zoology. Profile – Tasmanian Bettong]. University of Tasmania. ^ Foxes in Tasmania-Invasive Animals CRC Report http://www.dpiw.tas.gov.au/inter.nsf/publications/lbun-6r26gg?